This simple dessert made with a gingernut-biscuit base is from new book The Farm Community, which tells the story of a Byron Bay farm project inspired by the values of “simplicity, sustainability and farm-fresh food”. The Farm Community authors, Emma and Tom Lane, began The Farm at Byron Bay after moving to the area from Sydney in search of quieter life. It has now become a community of organic growers, chefs and bakers, and is also home to a restaurant called Three Blue Ducks. The Lanes’ book, published this month, shares stories from the farm, tips for living more sustainably, and recipes collected from The Farm’s community. I always try to cook using ingredients that inspire and surround me, and because I’m usually around bees, desserts are a common occurrence. I created this recipe by combining a few of my favourite things: honey, cheesecake and macadamias. Break the gingernut biscuits with your hands into the bowl of a food processor. Process the biscuit pieces until they are finely chopped. Add the melted butter to the biscuit crumbs and process until combined. Press the biscuit and butter mixture into the bottom of the springform tin to form the base of your cheesecake. Place the tin in the freezer for 20 minutes to allow the base to set. Meanwhile, thoroughly wash and dry the food processor bowl. Chop the cream cheese into cubes and add to the food processor bowl with the honey, then process until smooth. Add the cream to the cream cheese and honey mixture and continue processing until thick. Stir in the chopped macadamia nuts. Remove the base from the freezer. Spread the cheesecake filling evenly on top. Cover with plastic wrap and place in the freezer overnight, or until firm. Around 15 minutes before serving, remove from the freezer to soften at room temperature. Serve the cheesecake with fresh honeycomb, edible flowers and extra chopped macadamia nuts. Store any leftover cheesecake in the freezer. 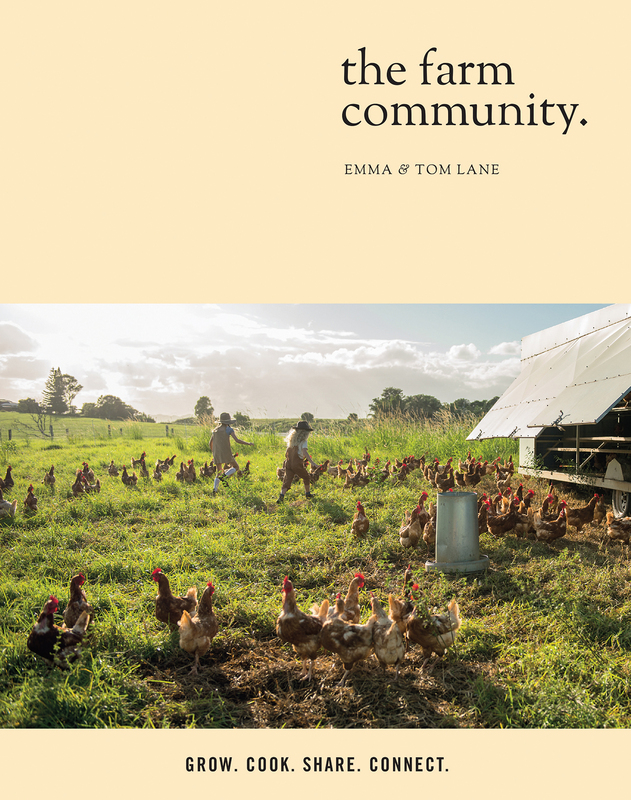 This is an edited extract from The Farm Community by Tom and Emma Lane, published by Hardie Grant Books, $39.99. Photography: Alan Benson.